so let me quickly describe the scents as best as I can, you may know that this is not my best skill, but anyways, lets see which candle scent is my favorite. I absolutely love the scent of the RIVIERA ESCAPE candle, it is extremly fresh and clean. somehow this reminds me a bit of the clean cotton and midsummer night candles from previous collections. the SUMMER PEACH candle is amazingly fruity, a bit too fruity for me, but nevertheless it does not smell artificial and I can smell real peaches! OLIVE & THYME would be my go to summer evening balcony sitting time candle. mmhhm, I love it and I would say that its a very nice balance in between thyme and olives. last but not least I want to describe SEA SALT & SAGE, this scent I got not in the candle version but as a WAX MELT. you can either use an old oil lamp or find other suitable melt warmers. 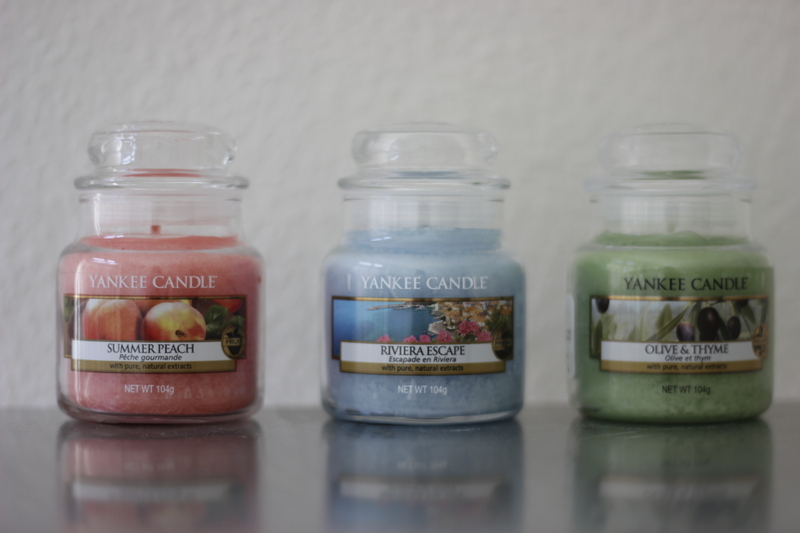 its very easy, all you need is a wax melt, a wax melt warmer and a normal rechaud candle.you put the wax melt in the wax melt warmer, lid the candle and wait for the wax to melt and your room to smell nice. 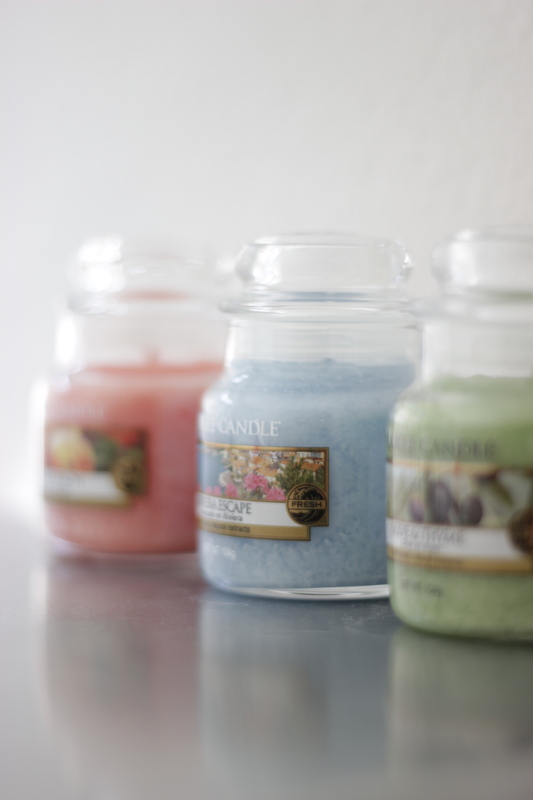 my favorite candle is the RIVIERA ESCAPE. I am sure that I am going to burn this next and am already looking forward to. shortly behind my favorite I would place the OLIVE & THYME candle. 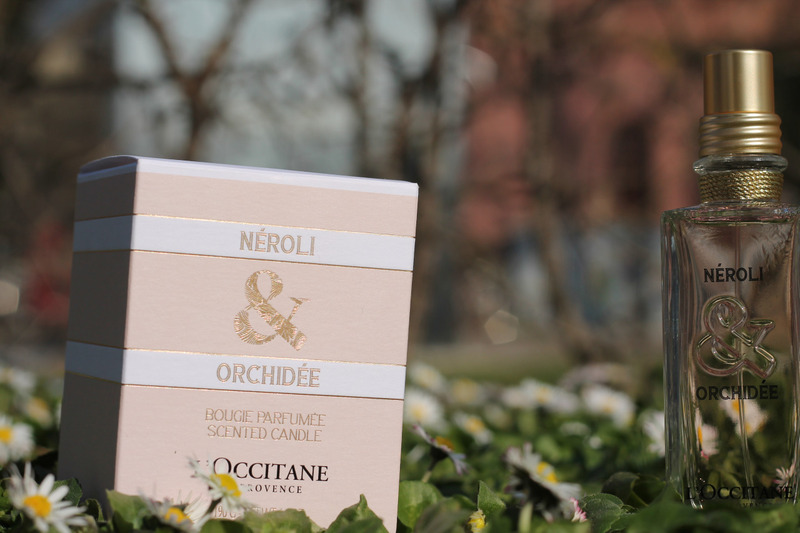 as I already said, this scent is more of an outdoor one and I will find a lovely place for it on my balcony. my third most favorite is the SEA SALT & SAGE wax melt and my least favorite is SUMMER PEACH. 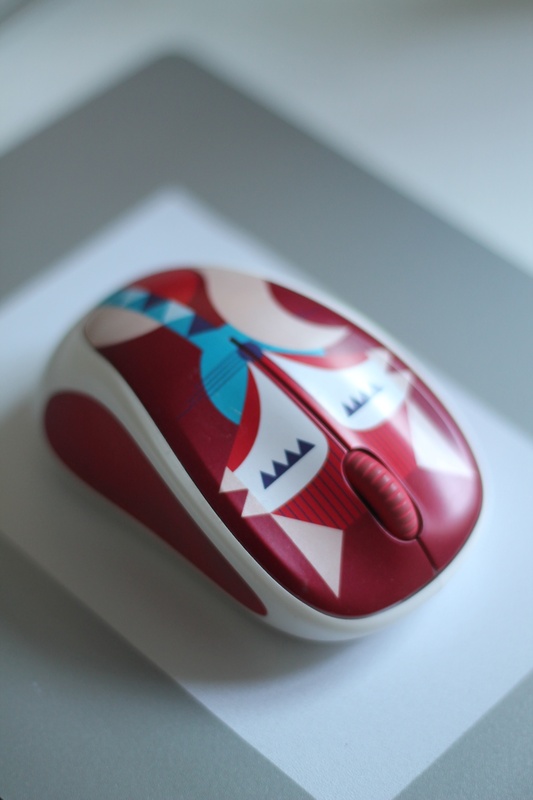 yay, I got a new lovely mouse via Logitech. thanks so much! the fox is called FRANCESCA and is part of the new ‪playcollection‬ ‪‎logitechM238 and I was thinking of calling her ERICA. somehow I think this name suits the fox better 🙂 anyway, I have been working with this sweet bugger for the last couple of weeks and I really like it! another nice thing is the price: 29.90 CHF which really is a bargain plus it makes me happy to see a little fox instead of my grey mac mouse. now what else is on my desk besides the iMac and the mouse? thats what it says on my rituals candle and I absolutely love the message. it is so true but not always easy to accept what is. I struggle with that but I have to say that I feel a lot better since 2013 and that almost every day that has passed since then was a good day! 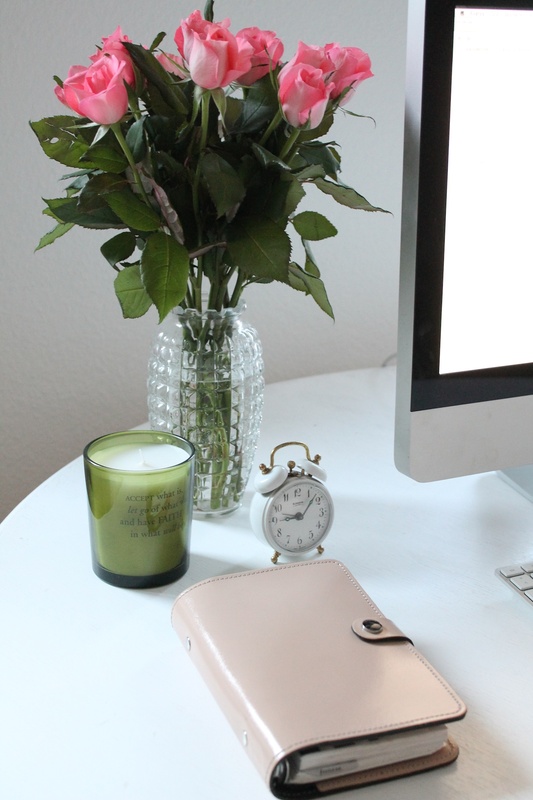 when I work at my desk for my blog from at home I want to feel good and thats when the flowers come in. I love flowers and I try to spoil myself every week with new ones. this week I chose pink roses and put them in the old vase I have found at the fleamarket. another important thing on my desk is my agenda, I am still oldschool when it comes to scheduling my time : ) the cutest thing next to the little fox is the white clock that I also found at the fleamarket it is a mechanical one with no batteries and makes quiet some noise but like with almost everything one gets used to it after a while..
this is something new, something fresh and floral, perfect for spring! 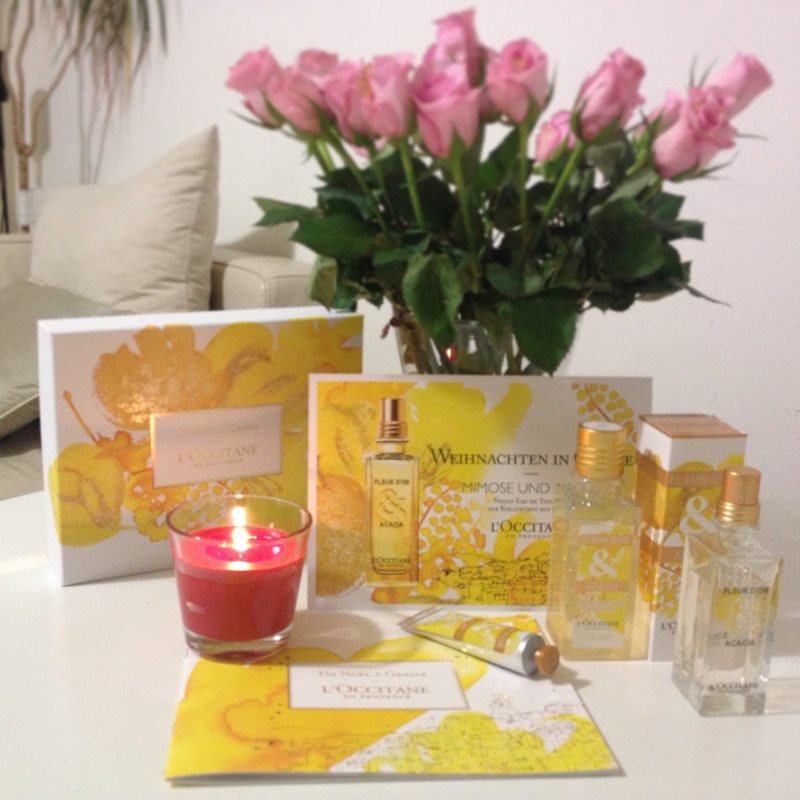 Karin Dubreuil is the creator of the La Collection de Grasse and she was very inspired by the orange blossom when creating this new eau de toilette. Christmas is ahead – are you in the mood yet? I received the L’OCCITANE en Provence Fleur D’Or Acacia parfum, showergel and handcream and I can tell you that I absolutely love the fragrance. A couple weeks ago I took this photo and uploaded it to my instagram and ever since I have been using the showergel everyday. So I will definitely repurchase this kit.